For Conroe residents who might have strolled past the historic Crighton Theatre last Saturday evening, there was a good chance of hearing audience laughter rolling out the doors, rather than the elegant tunes of composer, Cole Porter. The Stage Right production in progress was Ken Ludwig’s, “Lend Me A Tenor,” directed by Manny Cafeo. The show originally scheduled was “Cole,” a tribute to the life and music of Cole Porter, which will hopefully make it to the Crighton stage at a future date. Technical issues surrounding acquisition of that show had caused the substitution of Mr. Ludwig’s comedy. For those preferring laughs to the superb music of the extensive Porter songbook, that may have been a good thing. Intermission provided some pleasant recorded big band music, and tasty coffee in the lobby. Then the antics of Act Two proved to be the funniest part of the play. Imagine Max being tapped to fill in for Tito in the role of Otello. On the other hand, why not drop by the Crighton and see for yourself. Another local company, Texas Repertory Theatre, had planned a production of Shakespeare’s “Romeo and Juliet” that had to be replaced by this month’s merry offering of Paul Rudnick’s, “I Hate Hamlet,” directed by Craig A. Miller. Steven Fenley starred impressively as the ghost of John Barrymore in this oft-amusing farce which tells the tale of young, successful T.V. series actor, Andrew Rally (Rob de los Reyes), who moves from Los Angeles to New York for a chance to play “Hamlet” with Shakespeare in the Park. As luck would have it, a nutty, psychic realtor named Felicia (Marcy Kearns), rents Andrew the medieval, castle-like apartment (scenic designer, Liz Freese) that had been the home of the late Barrymore. With comic flair, Jen Lucy played Andrew’s silly and virginal girlfriend, Dierdre. Fenley’s explosive and smoky first appearance as the ghost was quite dramatic, not to mention amusing, as he arrives a bit dazed and declares, “Am I dead or just terribly drunk?” Also dramatic were Fenley’s fine deliveries of several “Hamlet” soliloquy samples while instructing Andrew on how to succeed in the role Barrymore played to such acclaim. Rick Olvera played Gary, Andrew’s annoyingly super-hip writer/director pal from Hollywood, and Barbara Lasater rounded out the fine cast as Lillian, Andrew’s agent. 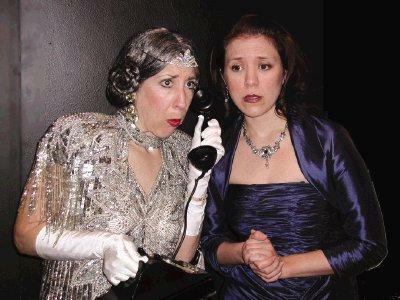 For details of Texas Repertory’s upcoming productions, visit the website at www.TexRepTheatre.org. Stage Right’s “Lend Me a Tenor,” continues at Conroe’s Crighton Theatre through March 7th with Friday and Saturday evening performances at 8 p.m. and Sunday matinees at 2 p.m. today and on March 7th. For further information call 936-441-7469 or visit the website at www.stage-right.org.